There is also an escaped invasive European hawthorn (Crataeugus monogyna) that should be avoided. Plant the native hawthorn instead! Provides excellent food and shelter for wildlife. White flowers with blackish fruit. 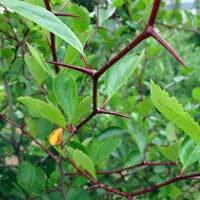 Infrequent, but sharp thorns add spiny interest.